Go back to where it all started with this Star Wars A New Hope Leia Hero of Yavin Mini Bust! This amazing mini-bust illustrates the pride that Leia shows at the end of the film as she knows the Death Star has been destroyed and no other planets will face the same fate as her home world. This hand painted mini-bust was digitally sculpted by master artisans, using the highest quality polystone and actual archival footage and designs. 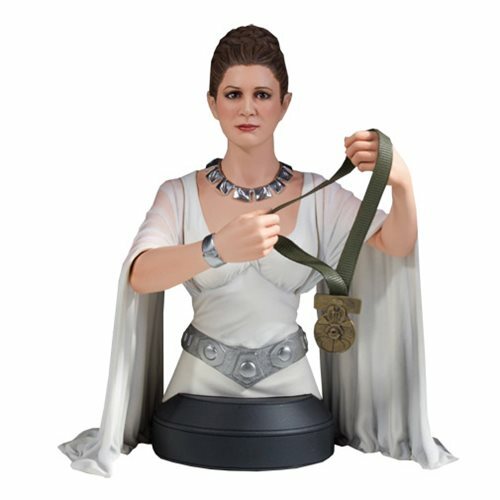 This Star Wars A New Hope Leia Hero of Yavin Mini Bust is individually numbered and comes with a matching certificate of authenticity. In the triumphant scene at the end of Star Wars: A New Hope, we see Princess Leia Organa decorating Luke Skywalker and Han Solo with the Medal of Yavin, for their gallant effort that resulted in the destruction of the Imperial Death Star. Bust is 1:6 scale, final size estimated to be near 6-inches tall.